A television camera and several other pieces were taken from Surveyor 3 and brought back to Earth for scientific examination. Here, Apollo 12 moonwalker, Pete Conrad, examines the Surveyor’s TV camera before detaching the gear. The lunar mystery swirls around the Apollo 12 moon landing and the return to Earth by moonwalkers of a camera that was part of an early NASA robotic lander – the Surveyor 3 probe. The Surveyor 3 camera was easy pickings and brought back to Earth under sterile conditions by the Apollo 12 crew. When scientists analyzed the parts in a clean room, they found evidence of microorganisms inside the camera. In short, a small colony of common bacteria -- Streptococcus Mitis -- had stowed away on the device. The Surveyor 3 camera shown with astronaut Pete Conrad and technicians at the NASA Lunar Receiving Laboratory upon its receipt after the Apollo 12 mission Nov. 1969. The camera was then bagged for later studies, including the microbial sampling of the camera. A diligent team of researchers is now digging back into historical documents -- and even located and reviewed NASA's archived Apollo-era 16 millimeter film -- to come clean on the story. 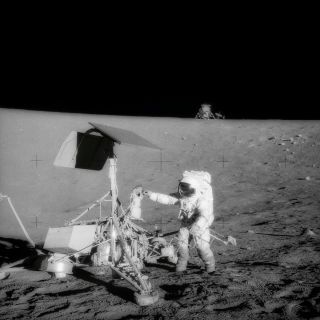 The Surveyor 3 camera-team thought they had detected a microbe that had lived on the moon for all those years, "but they only detected their own contamination," Rummel told SPACE.com. A former NASA planetary protection officer, Rummel is now with the Institute for Coastal Science & Policy at East Carolina University in Greenville, N.C.
Rummel, along with colleaguesJudith Allton of NASA’s Johnson Space Center and Don Morrison, a former space agency lunar receiving laboratory scientist, recently presented their co-authored paper: "A Microbe on the Moon? Surveyor III and Lessons Learned for Future Sample Return Missions." A still image taken from a digitally transcribed version of the original 16mm film of the microbial sampling of the camera. Two investigators stand in front of the laminar flow bench in which the camera resided during sampling. Note that they are wearing masks and head coverings that do not fully cover their heads, short-sleeve scrubs that do not extend below the level of the bench-top (allowing air potentially to blow into and out of them), and gloves over their hands but with no protection for their arms. Their verdict was given at a meeting on "The Importance of Solar System Sample Return Missions to the Future of Planetary Science," in March at The Woodlands,Texas, sponsored by the NASA Planetary Science Division and Lunar and Planetary Institute. "If 'American Idol' judged microbiology, those guys would have been out in an early round," the research team writes of the way the Surveyor 3 camera team studied the equipment here on Earth. Or put more delicately, "The general scene does not lend a lot of confidence in the proposition that contamination did not occur," co-author Morrison said. For example, participants studying the camera were found to be wearing short-sleeve scrubs, thus arms were exposed. Also, the scrub shirt tails were higher than the flow bench level … and would act as a bellows for particulates from inside the shirt, reports co-author Allton. Other contamination control issues were flagged by the researchers. In simple microbiology 101 speak, "a close personal relationship with the subject ... is not necessarily a good thing," the research team explains. All in all, the likelihood that contamination occurred during sampling of the Surveyor 3 camera was shown to be very real. Dressed for the occasion! Today's well-garbed NASA sample return analysis team is much more effective at detecting microbes while avoiding cross-contamination. On one hand, Rummel emphasized that today’s methods for handling return samples are much more effective at detecting microbes. However, the Surveyor 3 incident back then raises a cautionary flag for the future. "We need to be orders of magnitude more careful about contamination control than was the Surveyor 3 camera-team. If we aren't, samples from Mars could be drowned in Earth life upon return, and in all of that 'noise' we might never have the ability to detect Mars life we may have brought back, too," Rummel said. "We can, and we must, do a better job with a Mars sample return mission." Winner of this year's National Space Club Press Award, Leonard David has been reporting on the space industry for more than five decades. He is past editor-in-chief of the National Space Society's Ad Astra and Space World magazines and has written for SPACE.com since 1999.